Want the trendiest, chicest contemporary Christmas tree in town? Look no further than our guide to this year's most beautiful contemporary Christmas tree decorations. From light and airy to folksy and even black, we cover the best in Christmas tree baubles and ornaments for an on-trend look you'll love. For more Christmas gift guides and decorating ideas, visit our dedicated page. Want your contemporary Christmas decorations to match your polished Mid-century decor? Choose the satisfyingly shiny Copper Christmas Hanging Decorations from Red Lilly. If you're bored of baubles, there are plenty of alternatives out there. Keep it classy and sophisticated with the Musical Instrument Tree Decorations from Melody Maison. The traditional Christmas apple gets a clever, fashion-conscious update: the Sparkly Apple Christmas Decoration from Lime Lace is beautifully textured and has a subtle, foil-like sheen. Snow White goes to Chanel. Banish the heaviness of the traditional red-white-and-green Christmas colour scheme by choosing airy and transparent decorations. The Iridescent Soap Bubble Glass Baubles from The Contemporary Home really look as if you could pop them by just blowing on them. Delicate and chic. To add a touch of rustic Scandi chic to your contemporary Christmas tree decorating scheme, pick wooden decorations. Our favourites are the Twelve Wooden Trees & Stars from Cox & Cox. How gorgeous are these Peacock Humming Bird Decorations by Gisela Graham? Even if you have nothing else on your Christmas tree, you'll want to look at it all day with these beauties on. Available at The Contemporary Home. Why should your baubles be an LED-exception? Bauble and Christmas tree lights in one? Christmas tree decorating sorted. The Ceramic LED Christmas Bauble is available from Lights4fun. It's official: the grey decorating trend has infiltrated Christmas. Our advice? Go for a variety of textures if you are sticking to a monochrome Christmas tree palette to prevent your tree from looking too, well, grey. The Mini Baubles in Dove Grey are from Cox & Cox. 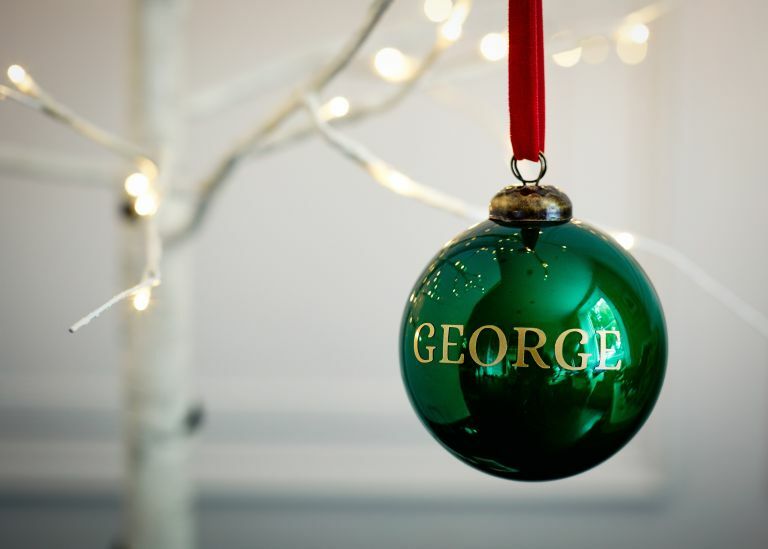 The Personalised Baubles from The Handmade Christmas Co are classy, with a variety of colours and finishes on offer; plus, the baubles make a perfect stocking filler. What's not to like? Break up the sea of traditional baubles with the angular Diamond Drop Baubles from Cox & Cox. They will look especially stunning if the rest of your decorations are also transparent. Contemporary doesn't always have to mean plain. We love the fairy-tale vibe of the Painted Glass Fox Bauble by Gisela Graham. After all, when else do adults get to indulge their love of folk tales, if not around Christmas? For a really sophisticated look, try decorating your tree with elongated decorations; our pick is these Blue Teardrops from B&Q. Ok, we know this is really pushing it, but black really can work as part of a contemporary Christmas tree decorating scheme. The trick to pulling off black is to add interest with different shapes and textures. The Black Glass Baubles from Cox & Cox have both; we want them. Green on green make very pleasing contemporary Christmas tree decorations. How to get it right? Pick lots of different shades of green for plenty of interest, and inject some gold for a shimmering, festive look. Our favourites this season are the green and gold decorations from Dobbies. Perfect as a gift for pet lovers, the Whippet Bauble by Paintmydog is one of several handmade, hand-drawn designs offered by the Staffordshire-based company. We love their graphic colour-scheme, which will make a perfect addition to a contemporary Christmas decorating scheme. Embrace the exotic decorating trend this Christmas, while giving a nod to the current craze for botanics. The Cactus Christmas Baubles from Lime Lace are gorgeous and shiny, and will bring a light-hearted touch to your contemporary Christmas tree decorations. A space-themed Christmas tree? Why not, if it means not doing white and gold again. We love the swirling, iridescent colours on the Midnight Magic Glass Iridescent Bauble from Wilko.